This is our Special Edition BoxCutter Magazine Issue for October 2017! A lot of hard work by so many wonderful people went into this edition. We thank all of you for your time, efforts, and so much more. We need to keep having open conversations about domestic violence all over the world. We hope and pray that this magazine, and with future editions, this can help with the process of healing and educating others. 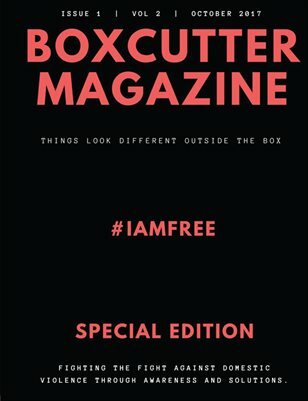 Boxcutter Magazine is a non-profit charity organization that was founded December of 2010. This is locally based and operating in Norfolk, VA. This grass roots organization is designed to assist victims of domestic violence through education, community awareness, mentoring, volunteerism, and charitable donation. Offering financial assistance to clients by building and maintaining a fund created through donations, fundraising, campaigns, and a solid contributor base.